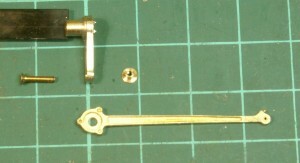 In the instructions the motion building starts with the expansion link and radius arm so these are the bits supplied. 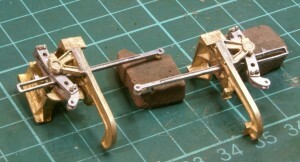 They are all brass castings, two halves for the expansion link and cast radius arm. The top one showing my effort to get the valve gear the right colour, i.e. steel. 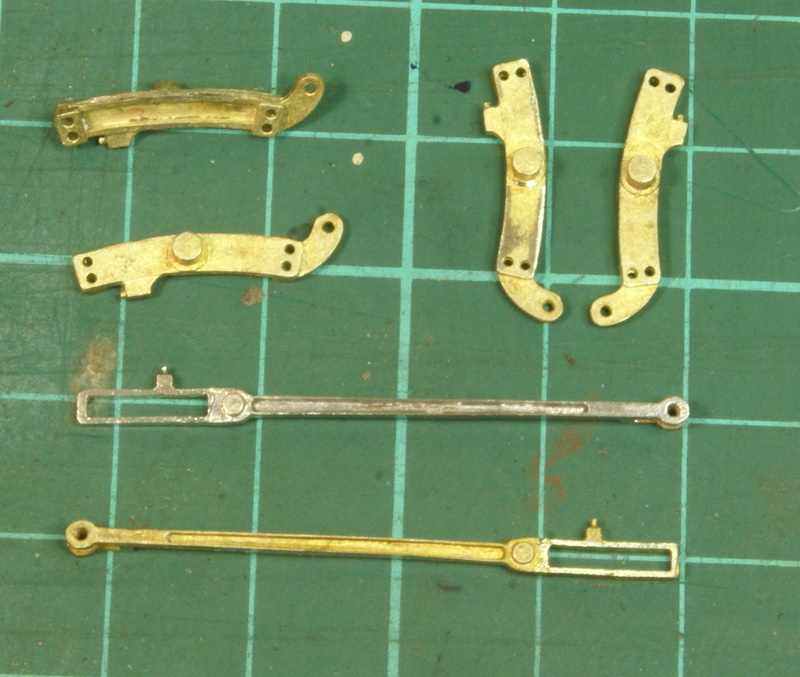 The brass castings are far too yellow for me so I’m experimenting with tinning all the castings to give me that steel colour. I’ll just have to be very careful soldering the joints!! Anyway as good as the kit is, it’s always useful to check the photos of the real loco. In this case there was a small discrepancy with the expansion link. 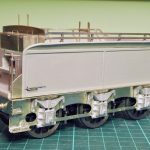 On the real loco the expansion link has a couple of extra holes. 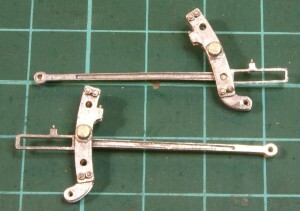 The extra holes were drilled in the appropriate place and then the two halves were soldered together around the radius arm. The radius arm has a couple of small spigots which locate in channels in the radius arm, so the radius arm can slide up and down the expansion link. 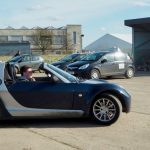 Make sure that the radius arm is fitted the correct way around, the small oil block on top and the forked joint to the rear. In the kit it suggests using nickel wire to pin the two halves of the expansion link but looking at the prototype the bolts in the link are quite prominant so instead of the wire I used some bolts from Scale Hardware. 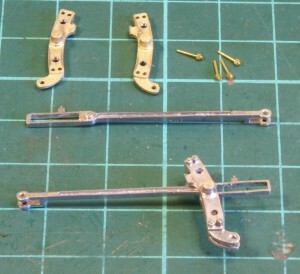 We then move onto the motion bracket and the journals which locate the expansion link. 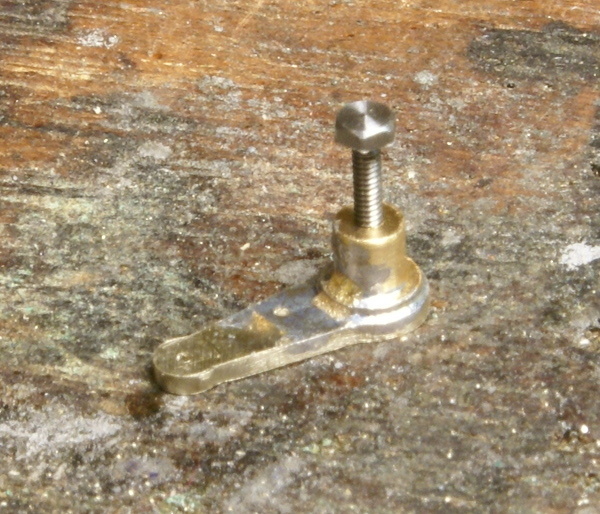 There are locating pips to help solder them in the correct position. 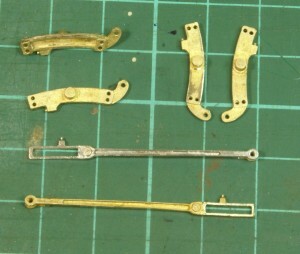 The return crank supplied in the kit is for the LNER style clinch bolt design. However not all the 4MT’s were to this design and the one I’d chosen had the LMS style 4-bolt return crank. I was going to have to make a replacement but I wasn’t too sure how to tackle it, o I kept putting it off. Then a thread on the forum Western Thunder covered the making of a 4-bolt return crank for a Patriot. So now I had no excuse. 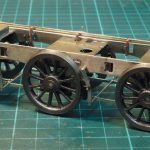 In Richard’s thread on Western Thunder he was marking and accurately drilling the 4 bolt holes on four separate components. There was no chance of me being able to achieve that kind of consistancy so I decided to make a drilling jig. This is the blackened steel component in the this photograph. It has the grid for the bolts with the centre hole like a No. 5 on a dice, it then has one more hole marking the throw of the return crank. I clamped this jig to a sheet of 38 thou’ nickel sheet and drilled all 6 holes. Once drilled I used the centre holes to mark out the shape of the return crank. The resultant piece being shown in the middle of the photograph. 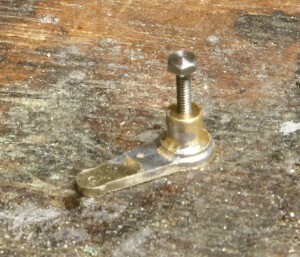 To represent the bolts I’m using Scale Hardware bolts at 1.0mm across flats. 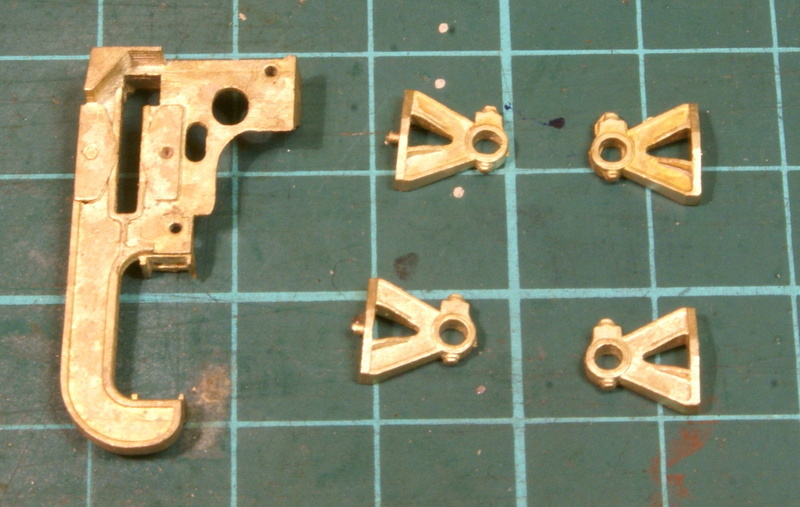 I then turned a brass top hat bush to fit the connecting rod which was drilled and reamed out to 1/8″. The centre of the bush was drilled and tapped out at 12BA, the centre hole in the return crank was also tapped 12BA. 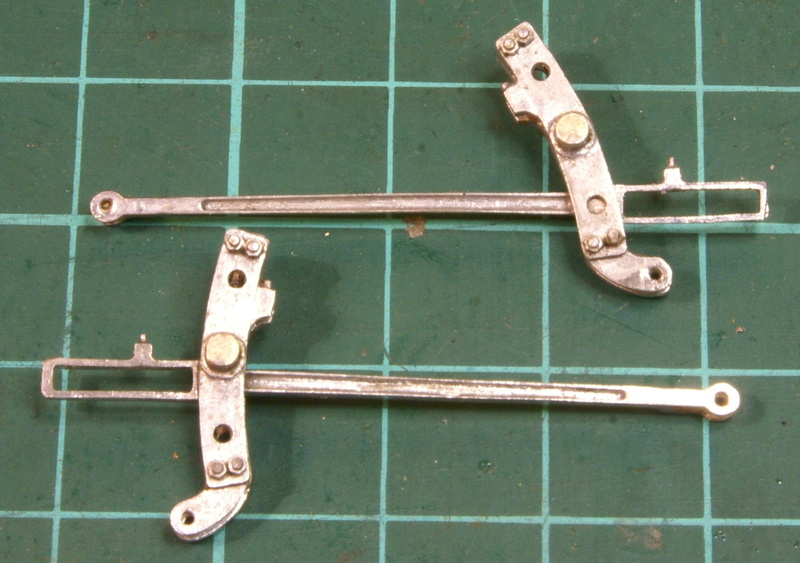 A 12BA steel bolt was then used to hold the two components togehter whilst they were soldered together. 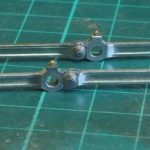 The drilling jig was then clamped to a piece of 10 thou’ nickel sheet but this time only the 4 bolt holes and the return pivot was drilled. 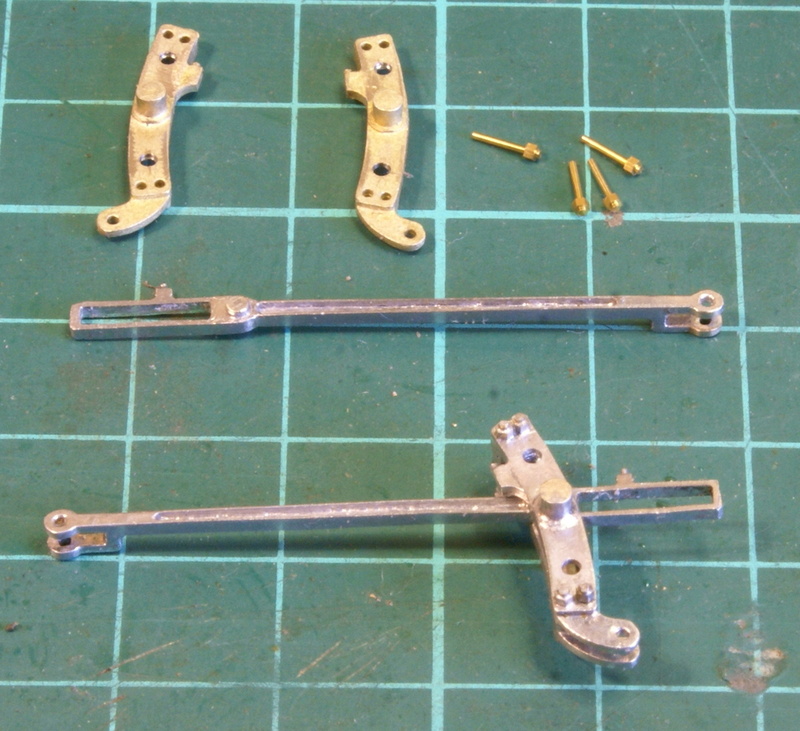 The jig was then removed and the 4 bolt holes were drilled larger (No.53) to clear the Scale Hardware bolts. This was only cut out roughly to shape then it was located and soldered to the thicker nickel sheet, with the scale hardware fitted. The thin nickel sheet was then filed down to match the main return crank piece. 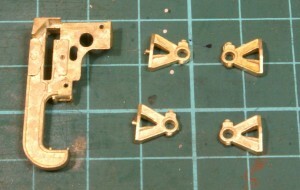 Using the drilling jig meant that the second return crank was fairly easy to construct to the same pattern as the first. Next in the instructions was fitting the eccentric rod to the return crank. 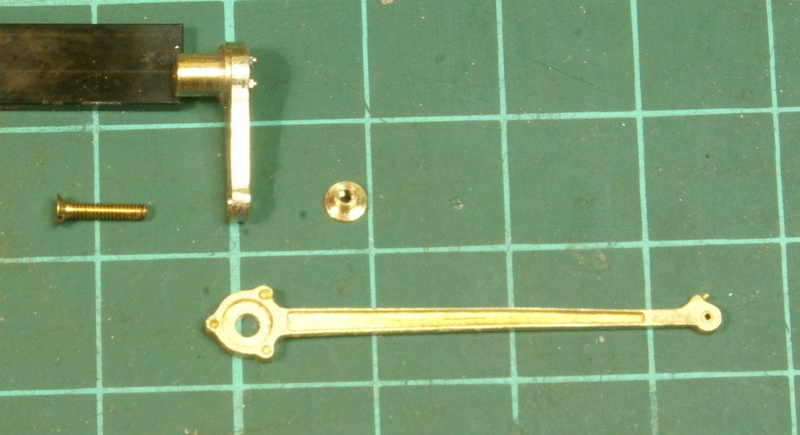 The eccentric rod is another nice brass casting and in the kit is supplied a cast brass pin which is intended to fit through the eccentric rod and solder to the return crank. However I decided to make a slight tweak to the design. I turned a small brass top hat bush and drilled and tapped it 12BA. 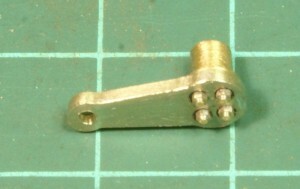 The attachment on the return crank was drilled 12BA clearance and the rear was countersunk. 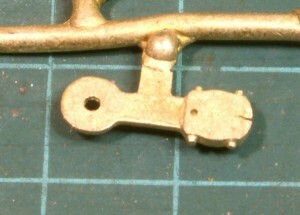 A shortened 12BA bolt then joins the two together, a small packing washer behind the eccentric rod may be required so that it doesn’t catch on the bolts of the return crank. 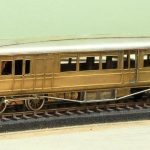 More details to folllow once I’ve built it.